News: Apple announced largest and most expensive iPhone model: iPhone XS Max, together with iPhone XS and iPhone XR, all having Retina HD display. Thanks to the Retina HD display, every HD Video picture you see and do on iPhone looks amazing, of course including the AVCHD videos. Even the image size is enlarged, it is still crisp and sharp. Images in HD movies are stunning at almost any angle. That's because the Retina display's pixel density is so high, your eye is unable to distinguish individual pixels. Can we play AVCHD video on iPhone? AVCHD is a format for the recording and playback of high definition video. Although originally AVCHD format is co-developed by Panasonic and Sony, by far almost all popular HD camcorder manufacturers provide AVCHD Video supported products, for instance, Canon HF S200, Hitachi DZ-BD10HA, JVC GZ-HM1. So it is quite possibly your self-made HD recording is based on AVCHD format (with .mts file extension). AVCHD records video at a range of resolutions including 1080p, 1080i and 720p, and will bring you up to 1920×1080 High resolution. 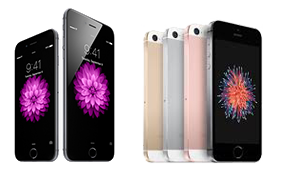 Since iPhone 8, 7 and 6S do not function as AVCHD player tool, let alone iPhone 5s/5c, it is a pity that you can not play and watch AVCHD Video on iPhone's amazing Big, Bright, Brilliant Retina Display or OLED Display. As well, you are not allowed to share your funny, amusing and inventive HD recordings with your family or friends through iPhone device. We always desire to share interesting HD recordings with others. And the perfect solution is Playing AVCHD on iPhone (because AVCHD Video is the mostly well-received HD camcorder recording and playback format, and iPhone is one of the most fantastic mobile media players). However, it will not come true until you Convert AVCHD to iPhone supported video formats. Don't consider it as a complicated stuff, some professional and efficient AVCHD Video Converter program will work it out for you, like WinX HD Video Converter Deluxe. It can convert AVCHD Video to MPEG-4/H.264, which is perfectly compatible with Apple iPhone (iPhone 8/7/6S/6/SE/5s/5c). And built-in high video converting technology, it will preserve the original high resolution image and visual effect for you. On a computer, you can Play AVCHD Video from the camcorder connected via USB as an external storage device, or from removable media or from the computer's internal hard disk drive. But on iPhone, the luck does not go so far. You know the AVCHD file has .mts extension, but video formats supported by iPhone are H.264 video up to 720p, MPEG-4 video, up to 2.5 Mbps, 640 by 480 pixels and M-JPEG video up to 35 Mbps, 1280 by 720 pixels. So if you want to play AVCHD on iPhone smoothly, you need to learn well WinX HD Video Converter Deluxe to convert video from AVCHD to iPhone supported formats. Right click "Add Video" table to load and import your target AVCHD video. If you have some AVCHD video source online, click "Add URL" button, enter the web address of that source, and WinX will automatically download it for you (WinX HD Video Converter Deluxe features Online Video Downloader). One of AVCHD video's advantages is that AVCHD video has several Audio/Language tracks. It is just the same case with DVD(AVCHD video is similar to DVD movies, like vivid image and selectable language track). Owning to Unique Multi-track Feature, WinX HD Video Converter Deluxe allows you to freely choose AVCHD video audio/language tracks. If your resource AVCHD video is not English or you want to learn other language, it is definitely a useful feature far beyond your imagination. 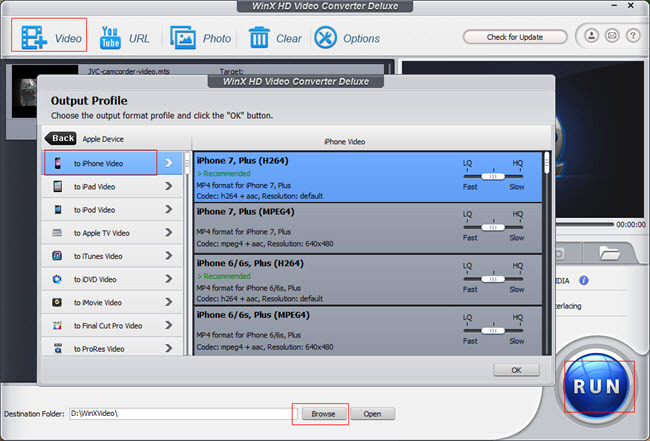 ● Feature 1 Specific iPhone Profile Setting: With WinX HD Video Converter Deluxe, there is no need to set the conversion parameters manually. Well prepared iPhone Profile Setting will save your time and offer you plenty iPhone setting options, range from iPhone 3 to iPhone 8/Plus. ●F eature 2 Powerful High Quality Engine: Equipped with High Quality Engine, WinX maintains the best preserved output video quality from the original AVCHD video. According to sufficient knowledge that has been put out in Press Release, we learned AVCHD video is Mostly Similar to MPEG-4 (exactly speaking, AVCHD video utilizes MPEG-4 AVC/H.264 (AVC) video compression codec). So when we convert AVCHD video to iPhone supported MPEG-4/H.264 video, the visual quality loss is regardless and undistinguishable. ● Feature 3 Advanced De-interlacing Engine: Furthermore, WinX HD Video Converter Deluxe can even improve your source AVCHD video. All AVCHD camcorders except for AVCHD Lite models use recording 1080 Interlaced Video (1080i).When watching converted AVCHD 1080i video on your iPhone (since it don't have built-in De-interlacing engine like flat-panel televisions), the image you see from AVCHD video will not be true to the original. But because of Advanced De-interlacing Engine, WinX HD Video Converter Deluxe supports converting AVCHD video from interlacing to progressive scanning. It will bring you more vivid and smooth AVCHD video image on iPhone. ● Feature 4 Resize Feature (Shrink the image size): Play and watch AVCHD video on iPhone, you need to resize AVCHD video's 1920x1080 resolution to iPhone maximally supported 1280x720 HD MPEG-4/H.264 video. And WinX HD Video Converter Deluxe's Shrink feature just made for bringing you this convenience. Step 4: Set the destination of converted AVCHD video and Start conversion. After learned the instructions above and get all presetting done, you can right click "Browse" to set the destination of converted AVCHD video and click "RUN". When the conversion is finished, just add the iPhone friendly video into iPhone with iTunes. To play AVCHD movies on idevices seamlessly, WinX MediaTrans, the best iTunes alternative and most media-focused iPhone manager, does better than general ones. It can auto convert common iPhone-hated video formats into MP4(H.264) while doing the file transferring from computer. Better still, it can auto rotate video to fit for iPhone full screen playback.